How do you travel with an OV chip card? Where can you buy an OV chip card? 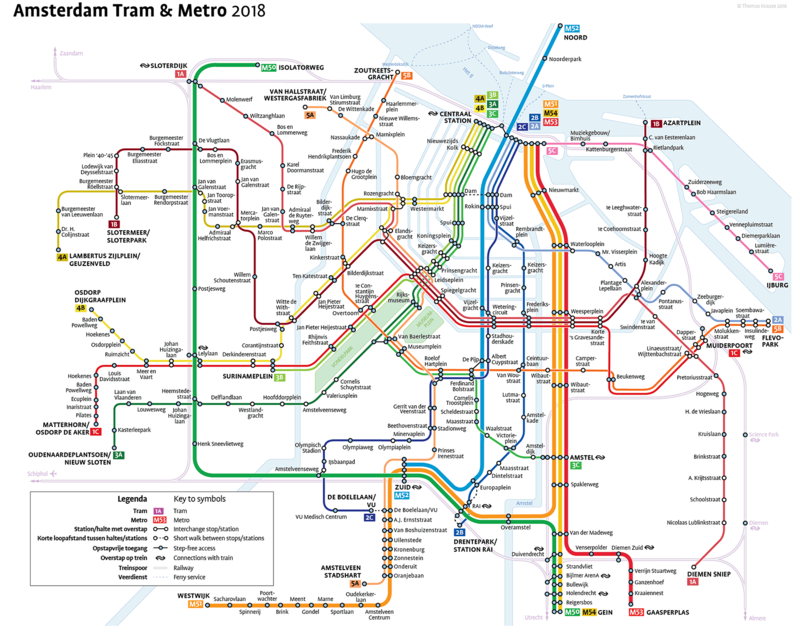 Tram, bus, ferry or metro in Amsterdam? Public transport is the way to discover all of Amsterdam’s sights and attractions. It is impossible to imagine a typical Amsterdam scene without the distinctive sound of tram bells! The city’s public transport system is extensive, with no less than 15 tram lines, 41 bus lines, 4 metro lines and 7 ferry connections ready to take you anywhere you want to go. The trams, buses and metros run 7 days a week from 6 a.m. to 12:30 a.m. In the hours between, you can still take a trip on one of the night buses. I definitely advise against going into the city centre by car. It is busy, the streets are narrow and parking is limited. And once you find a space, you will have to pay a lot for it. I always try to avoid going into town with the car! The trams are indispensable in Amsterdam. When traveling on Amsterdam’s public transport system, you will have to use an OV-chip card. You can choose from a range of options. If your stay in Amsterdam is a short one, the disposable day or multi-day ticket (2 to 7 days) would be the most convenient and best value choice. With a day or multi-day ticket, travel is unlimited on all trams, buses and GVB metro trains throughout Amsterdam. If you are in Amsterdam for one day, you can purchase a day pass. This is valid for 24 hours, starting from your first journey. You can switch between transport types and touch in and out as often as you want in 24 hours. To see all metro and tram schedules, use 9292.nl. Traveling with the OV-chip card can take some getting used to. It is important that you always touch in and out on every journey you make using public transport, as well as for every transfer. Many people (including myself) often forget to touch out. To touch in, simply hold your card in front of the card reader. You will find these at all tram and bus entrances and exits. You will hear a beep and a green light will come on. When leaving the tram or bus, touch out by holding your card in front of the card reader again. This time you will hear two beeps. When in the metro station, hold your card in front of the card reader at the ticket barrier. The ticket barrier doors will then open. You will have to touch out at your destination station. All OV chip cards, such as the day or multi-day tickets, can be purchased at GVB Tickets & Info. If you already have an OV chip card you can easily order a day or multi-day ticket online and load it at a loading device. You can find loading devices throughout the city. The GVB day ticket can also be purchased from the tram or bus driver, or from a conductor. Make sure you have the right change. You can also purchase day tickets from ticket machines at all metro stations. I am sometimes asked what is the best way to travel in and around Amsterdam. Do I prefer the tram, bus, ferry or metro? The tram is by far the most popular, and the mode of transport I usually prefer. With the tram you can go anywhere you want (or at least close by). Trams also run very regularly, which is handy. The bus network is good, but not as extensive as the tram network. There are many regional buses which come into and leave Amsterdam. The metro network is not as comprehensive as those in cities such as Paris or Rome (we are working on this), but it is completely functional and widely used. But you will miss the ‘city atmosphere’ when you use this method of transport. 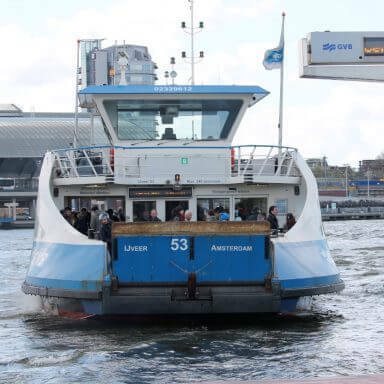 The ferry (also included in Amsterdam’s public transport system) is a great way to travel. The ferry is a free connection between the centre and the north of Amsterdam. My tip for tourists when it comes to public transport in Amsterdam is to take a ride on tram 2. The first part of the route runs from Centraal Station to Hoofddorpplein, taking you past a large number of attractions including the Vondelpark, various canals, the Rijksmuseum, the Stedelijk museum and the Van Gogh museum. According to National Geographic Traveler magazine, Amsterdam’s tram 2 route is one of the most beautiful in the world! They report that when it comes to picturesque tram journeys, Amsterdam is up there with cities like New Orleans, Budapest and Berlin. For your convenience, I have added a map so you can plan your trip. If you want to go for a day out, go for it! Zandvoort is highly recommended. There is a direct train connection from Amsterdam to Zandvoort aan Zee, meaning you can be on the beach in just half an hour. Use Ns.nl to see and track all train connections. 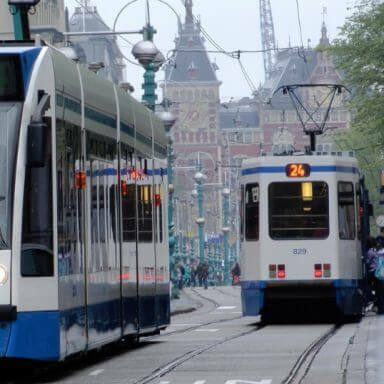 If you come to the Netherlands by plane, the cheapest and most convenient way to get to the centre of Amsterdam is, of course, by public transport. Approximately ten train departures travel from Schiphol to Amsterdam every hour. The first train leaves at 6 a.m. and the last one departs at 12:28 a.m. Night trains run once an hour. You can find the train station directly underneath Schiphol Airport, and can reach it via the Arrivals Hall or Schiphol Plaza where you can also buy your tickets. If you prefer to travel by bus, the bus station is situated right next to the airport. From here you can take the Amsterdam Airport Express bus (bus 197) at the B9 stop. This red bus runs every fifteen minutes and takes you directly to the city centre. Night bus N97 takes the same route as bus 197 and runs once an hour from 1 a.m. to 5 p.m.
Map of all the public transport connections in Amsterdam. Thanks for the guide. Navigating will never be the same again! 628 visitors rated Public Transport average 4.5 stars out of 5.